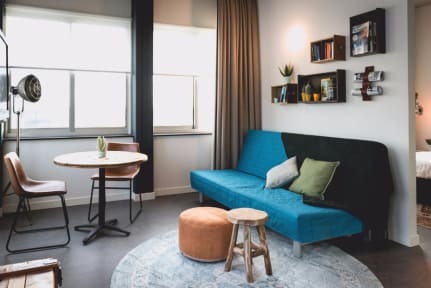 Hotel Nimma i Nijmegen, Holland: Reservér nu! Hotel Nimma, the place where people come together to eat, work, drink or spend the night. For backpackers, businesspeople, lovebirds or partypeople. A place with a industrial and warm character where you will easily feel comfortable. Where you can be yourself, meet people or just retreat and relax. To kickstart your workweek with a with a healthy breakfast or to kick off the weekend with a local brewed beer. Accessible and for a fair price. 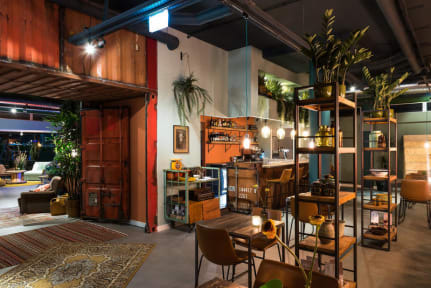 Hotel Nimma is situated near the river Waal and is surrounded by creative and cultural hotspots as the former factory Honigcomplex and Vasim. Park your car for free and enjoy the ride to the city centre on a cheap rental bike, which is 5 minutes away. With 27 rooms Hotel Nimma is the ideal place for a short citytrip or a comfortable business long stay. Our rooms feature comfortable beds, flatscreen TV and free WiFi. We also have some rooms with a small kitchenette. If you’re alone, with your family or your football team, Hotel Nimma welcomes you! Check in from 15:00 to 22:30 . Taxes not included - city tax 2.16 EUR per person per night.